Last Day of Cardinal Country and EGA Seminar | NJNA is Blogging! It seems impossible to believe that my week in Louisville is almost over. Sue will drop me off at the airport tomorrow before heading home to Mendham. I think I would much rather be driving with Sue! Today’s class continued much the same as the other days — with us just stitching whatever we wanted and Joan teaching us each new thing as it arose. Today I learned the fly stitch for leaves and needle-weaving — also for leaves. 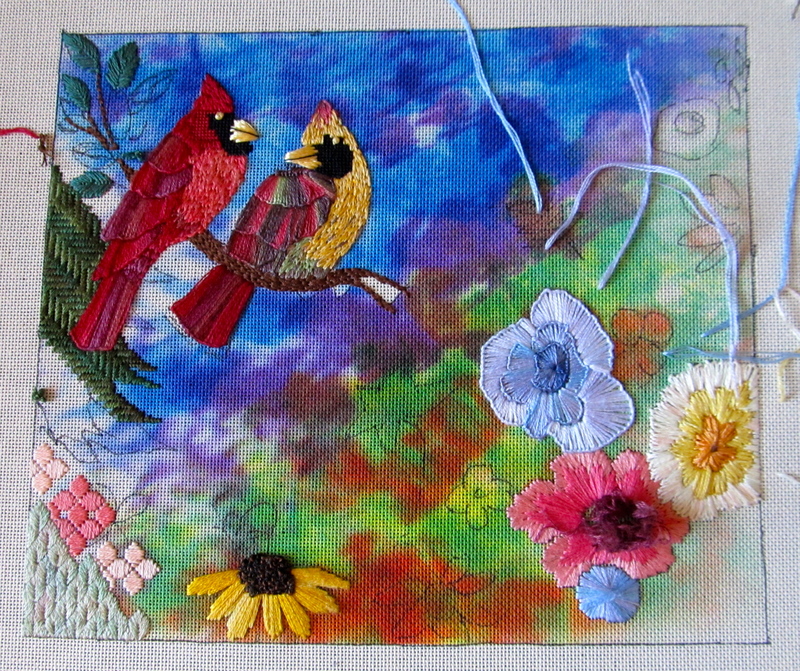 I finished two blue flowers and a smattering of pink ones. The EGA Banquets are much more compact affairs than the ANG ones — not so many speeches or prizes or drawings. Sue and I both put in our preferences for classes next year in Phoenix.